What you need to know about the cost of solar panels in Alberta. Long-term economics, job cost breakdown, payback period, LCOE and more. How much do solar energy systems cost? This is the number one question surrounding the solar PV industry. The answer is – it’s quite variable. Numerous factors must be considered such as your roof area, azimuth, pitch, budget and desire. We will discuss all of these and outline some general costs for solar panels in Alberta. You might be wondering how the azimuth/pitch affects the cost of solar panels, isn’t it just one lump sum cost? The first category is the cost to buy solar panels (i.e. the initial investment required) for systems of various capacity (size). The second category is more in-depth and will outline the long-term economics of solar power in Alberta. This is extremely important for calculating your ROI, and payback period. In this category we will work through a real example with up-to-date metrics for 2017. There is no general way of assessing the cost of solar panels for every individual’s home without giving a free site appraisal. This is set to change as new technology becomes available, such as Google’s Project Sunroof, but for the time being, to accurately assess the potential for solar panels on homes we must do so on a case by case basis. Obviously we won’t leave it on such general terms, we will get into how much different solar power systems cost. But first, let’s realize what goes into a solar installation in Alberta. The chart above shows a typical breakdown for solar installations in Alberta. 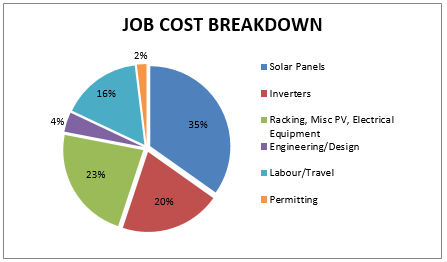 Material makes up approximately 70% to 80% of the total job costs, with the biggest culprit being the solar panels themselves. Installation labour is the next major cost category besides material. ASIDE: Installation personnel MUST be certified electricians to install solar modules in Alberta. There should never be more than two apprentice electricians for every one Journeyperson. If the apprentice is just learning the trade, then it is best practice to have just 1 apprentice per Journeyperson. Naturally, this breakdown will vary from job to job, but this should give you a good sense of where your money is going. Solar is typically assessed in Dollars per Watt ($/W) which gives a fair representation of the value of your investment aka your “bang-for-buck.” This value is similar to $/sq ft. in the flooring or painting industries. Low $/W = Favourable. High $/W = Unfavourable. Like most things you purchase, the economies of scale play a major role in the cost of solar panels. This is due to 1) Fixed baseline costs such as permitting and engineering and 2) Installation time. Baseline costs are fixed, meaning the more solar energy you can stack on top of them, the lower your $/W will be and the better value you will get for your investment in solar panels. Installation time plays a major role too. There will always be a set amount of fixed installation time for setting up, unloading materials, and cleaning up. The time it takes to install 24 solar panels is roughly identical to the time it takes to install 22 modules which means for the same amount of fixed/labour cost you get more power and a lower $/W. These are the reasons why the $/W significantly drops as the size of your array increases. The graph below gives a general representation of solar costs vs system capacity. But what is the capacity of a solar panel system? This means that your average solar installation in Alberta will be around $10,000 to $16,000, fully installed. Additionally, the cost of solar power may be reduced by the new Alberta residential and commercial solar incentive. Granted, there are many other factors that play into this. If you live far away, there may be more travel costs, or similarly, if you need some electrical work to safely install the solar power system then there might be additional costs as well (Kuby Energy is a licensed electrical contractor and will always ensure the proper devices are installed according to or beyond the Canadian Electrical Code standards). For solar energy systems in NWT for example, the average installation will likely be slightly higher due to the logistics of shipping and travel. With that said the higher electricity rates in NWT actually make the economics more favourable than solar power in Alberta. Is the same trend true for solar for businesses? Commercial solar systems follow the same general trends and guidelines as shown above in the residential solar cost breakdown. The key difference is that commercial solar arrays are generally quite a bit bigger, ranging from 15kW to 250kW+. As you can imagine, the price continues to drop as the scale increases. Large systems may actually drop to around $2.00/W fully installed. AND, there are tax incentives for commercial solar energy systems! If you’re a farmer, then the cost of the system will drop even further due to the Growing Forward 2 On Farm Solar Photovoltaics rebate program. All of these factors make businesses an ideal candidate to install solar panels. If you’re going to invest in solar power, you want to know what your financial outcomes are going to be such as how much money you will earn from the solar panels and what the payback of the investment will be. These terms can be a little deceiving since what is truly desired is whether it will save you money relative to continually renting electricity from the grid. We recommend not focusing solely on the payback period of solar panels, but analyzing the economics over 30 years since that is the period of the investment. The method used to calculate the economics of solar power in Alberta is called the Levelized Cost of Electricity or LCOE. The LCOE is the most accurate way to assess long term economics since this approach considers the total lifetime of the solar power system. 2. O&M Cost – Ongoing cost per year either provided by the solar installation contractor or estimated to be around $0-$200/yr. This will cover any replacements which may be needed in the rare event that an issue does arise or any insurance premiums which may be required. 3. Lifetime energy output – Annual energy output will be provided by your solar contractor. Remember that the system will degrade by ~0.5%/yr. Now we must estimate what the cost of electricity and what the cost of transmission and distribution charges will be in 30 years. Buying solar energy is essentially buying 30 years’ worth of energy up front, hedging against the price escalation of energy and the associated fees. The energy charge may be fully scaled to $0.00/mo. if your solar panels supply 100% of your energy. The distribution charge has two parts to it, a fixed charge and a variable charge. The fixed charge is usually assessed per day or per kW of demand that you require – solar energy cannot reduce this portion. The variable charge is based off how many kWh you required – solar energy will directly lower this portion. The transmission charge is based off how many kWh you require much like the energy charge and the variable portion of the distribution charge. Energy from solar panels will directly reduce the transmission charge as well. A clear breakdown of these fees is shown below from ATCO Electric. The numbers are accurate as of January 1, 2017. Different retailers will have different breakdowns based on their service area. To accurately compare grid electricity to solar energy, we must assess how much these rates will increase over a 30 year span. The Alberta Electric Systems Operator (AESO), whom manages and operates the provincial power grid, is expecting all charges to steadily increase over the next 20+ years (big surprise, right?). The image below is taken from their 2014 Transmission Rate Projection. The distribution charge has not been specifically identified by AESO, but in a recent presentation, Rob Baron, the Program head of Renewable Energy and Conservation of Lakeland College, cited a T&D escalation of nearly 6%. Granted, this number was for rural customers only and was not a 30 year projection. It is safe to estimate that the variable charge for distribution will likely escalate similar to the Transmission charge at approximately 2%/yr. With these estimations in mind we can now predict the cost of grid electricity over a 30 year span. To illustrate the comparison let’s look at an example of a solar power system in Alberta. The following example illustrates solar energy economics on a home in Alberta based on the ATCO pricing cited earlier. The situation will differ slightly if you were to examine solar panels in Edmonton or Calgary. As you can see the LCOE of solar is slightly better than that of using grid-tied electricity. Additionally, the investment in solar panels will yield a positive Net Present Value (NPV) and reasonable payback period which are all promising signs for an investment. But don’t be thrown off by the ‘long’ payback period or similar LCOE’s as neither tells the full story. The final comparison to take into account for the value of a solar power system is the overall value of using solar compared to the overall value of using grid-tied electricity. By ‘value’ I simply mean the overall costs and revenue from solar panels vs the overall costs and revenue from using the grid (there is no revenue from grid electricity). Isn’t a payback period of 15 to 20 years better than an infinite payback period? Another way of thinking about this investment is to compare it to a vehicle or a house. You wouldn’t rent a house for 30 years, would you? You wouldn’t rent a car for 30 years would you? Yes, it is a major up-front investment but it makes much more sense to purchase your home/vehicle to save money over the long-term and earn equity in the asset. Payback period for solar panels in Alberta, compiled by Kuby Energy. It is pretty staggering to see how much money is wasted on continually renting electricity for 30 years. This graph shows that you might save $100,000 over a 30 year span. Granted that value is future dollars which have not factored inflation or discounting. Most people get hung up on the ‘long’ payback period but don’t often consider that by not using solar power, you are still giving away thousands of dollars every year with no returns or equity in a tangible asset. The relative payback period provides a more accurate representation of how much money you are actually saving/earning from an investment in solar panels. I hope you consider the whole financial scenario when deciding whether or not to buy solar panels. Yes, it is a major upfront cost but much like buying a home, the cost will pay back over time. As the efficiency increases and the cost of solar panels decreases, the relative payback period of solar power systems will continually become even more favourable for consumers. 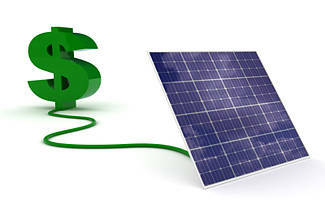 Investing in solar panels is a financially sound long-term decision.